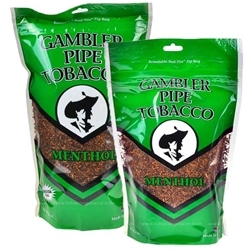 Gambler Pipe Tobacco is a well-known and well-established American blend that offers smokers a traditional and affordable brand of top of the line Burley and Virginia fine cut tobaccos. Don’t Gamble on un-known brands that are too strong and harsh, go with a prominent name like Gambler. Offered at a very low price right here at Smokers Discounts!